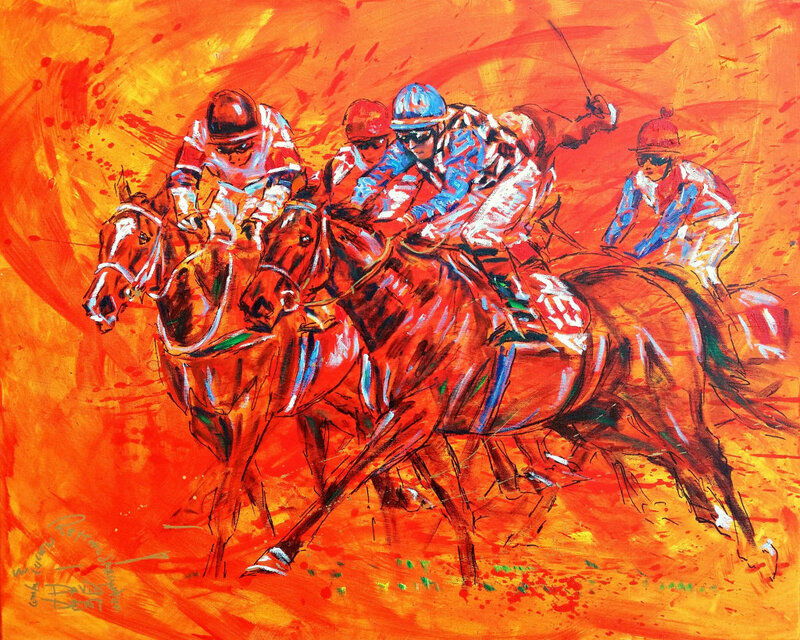 The Dents have been painting Czech horse racing scenes since 1995 when Charlie Mann won the Velka Pardubicka on 'Its a Snip' where they were the official artists tasked with recording the event. Every year for the next decade they would go there at least several times a year to exhibit. Only the banking crisis and subsequent withdrawal of funding to small businesses impacted the brothers ability to exhibit abroad. Still things are tough for small businesses but an opportunity invitation arose from course director and long time friend Petr Drahos which would be partially sponsored by Velka Chuchle Prague's racecourse, for their Czech Derby meeting. David's partner Zorica has just started her own small fashion business (Ascendance Jewellery and Fashion www.ascendancejewellery.com and David has also worked in fashion too styling magazine editorials etc from time to time. So there would be an exhibition and fashion show in the main grandsatnd on the prestigious Derby Day.